Surrounded by riders who weren’t competing at the time, Wilson received an education by some of the best athletes at the college level. “To be able to spend that time with the student-athletes and being taught by the young women who are so passionate about this and who for them this is such an important part of their lives, it was a remarkable experience. I really did learn a lot,” Wilson said. Wilson’s presence at the NCEA Championship was historic, marking the first time a NCAA official has attended the season-culminating event since equestrian was added to the NCAA’s list of emerging sports for women more than a decade ago. The moment has been a dream of NCEA executive director Dr. Leah Fiorentino’s for more than two years. And, it took a lot of work to make it come to reality. Thanks to efforts from the group’s National Advisory Board (NAB) and a change in how the organization is structured, the NCEA has worked to develop a deeper professional presentation. Coaches once spearheaded college equestrian’s growth. While they are still a vital part of the process, Fiorentino and others who have no stake in a specific school now oversee the NCEA’s operation, making sure the organization is balanced for every team involved. After years of work, the NCEA was eager to present how far it has come. With Wilson representing the NCAA and U.S. Equestrian Federation CEO Bill Moroney also on-hand, Fiorentino refused to waste the opportunity. “All the communication I received from both of them, post event, was so positive and so excited about the experience that the student-athletes were having and how impressed they were with the event itself, as well as these young women that were just terrific ambassadors for the sport,” Fiorentino said. Before Wilson’s arrival in Waco, the NCAA extended outreach to all three emerging sports it is currently monitoring. The governing bodies that oversee equestrian, rugby and triathlon at the collegiate level were presented with $5,000 endowments in celebration of Title IX’s 45th anniversary. The NCEA used the funds to bring back their distinguished alumni recipients for this year’s awards banquet. Once Wilson landed in Texas, it was a jam- packed schedule. 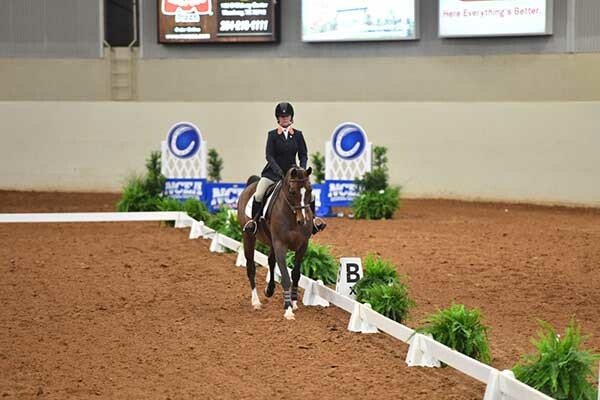 In addition to the on-the-fly equestrian education session, she got the chance to meet with Sweet Briar College and learn how important competing against higher-level competition was for the Division III school. She also spoke with Delaware State, the only Historically Black University to field a Division I equestrian team, sat down with members of the advisory board and chatted with Moroney about the USEF’s role in helping the sport grow. The open lines of communication have been crucial in helping the NCEA grow and that won’t change anytime soon. In order to become officially sanctioned as a NCAA Championship, 40 teams need to sponsor the sport. With the addition of UC Davis earlier this year, 24 schools currently comprise the NCEA’s membership. While it was a whirlwind experience, it was one Wilson savored. Reading about an equestrian competition is one thing. Seeing it in-person put the sport in a totally different perspective. Now, she’s taking that knowledge with her to Indianapolis to help the sport grow even further. “It was a really important opportunity for me to learn about it and what it is so when I get phone calls about equestrian, I can answer them in a more intelligent way and refer those on to Leah and her team at the NCEA,” Wilson said. “It was really a learning opportunity and a chance to show support and build some relationships as well in the equestrian community.